The Road Towards Common Ground. Native Peoples at Standing Rock, North Dakota Facing Unjust Suppression Again. Those with greater power, money and numbers have been suppressing native peoples for hundreds of years. They do so because they believe that they have the right; the right that strength bestows. And, still, native peoples continue to stand up for themselves; rising up again and again, until one begins to wonder, who is actually stronger? Which begs the fundamental question: does strength truly bestow a right to something, or is it the quality of being in the right which bestows strength? As A Result of Our Disbelief. At the heart of our human nature is the need to question our own lives; to search for the meaning within all things. So when society becomes shallow, materialistic and without spiritual morals, then that aspect of our nature which needs there to be a meaning, a purpose, to our existence will seek that purpose elsewhere. Witness the seeming ease with which fundamental extremism sways those trying to find their way. If our society is to save itself, the path to doing so lies in a return to basic morality, decency and a sacred respect for humanity and the natural world in which we live. Mankind must believe in something, be it God, nature, or the intrinsic goodness inherent within ourselves. Tragically, what our society believes in at this moment centres around material things and the belief that whoever has the most of these things, wins. We have abandoned the needs of the human spirit and, in so doing, allowed darkness to envelop light. Society is out of balance, has been out of balance for a long time now. Nothing makes sense; reason itself is absent. The blood-dimmed tide is loosed. Life holds little value to many and the few have no voice at all amid the confounding din. Upon the scale, selfishness overwhelms selflessness. Madness seems set upon the world. We have made a mess of it; there are no innocents here. We all point our fingers, though the blame is equally shared. Words like morality and virtue echo hollowly when unaccompanied by actions. The time is nigh; if we remain blind to the commonality of mankind then our travail is only beginning. In the distance clouds are mounting up amid this otherwise empty sky, like plumes of oily smoke rising from a fire of our own setting. Society will continue to falter until we embrace the fundamental quality of true humanity, which supposes that the suffering of one is the suffering of all. Why React To Terrorism With Terror? Terrorism: the use of violent acts to frighten the people in an area as a way of trying to achieve a political goal. Donald Trump's recent reaction, that all Muslims should be banned from immigrating to the U.S., political motivations aside, arises from fear. 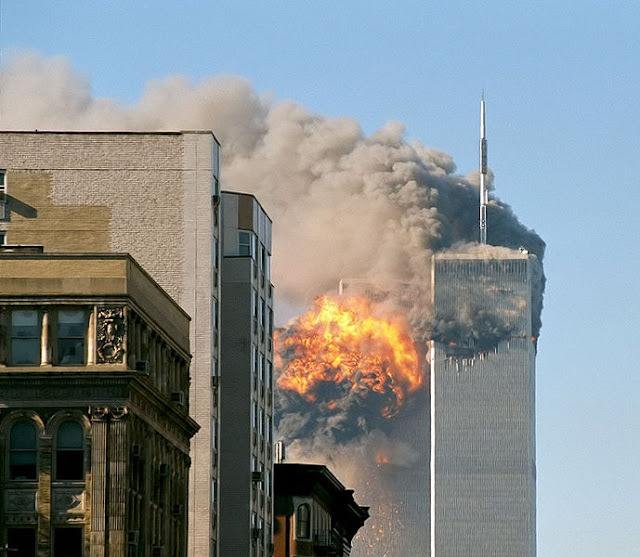 But, while it should come as no surprise when the reaction to terrorism is terror, if we recognize this reaction for what it is, we begin to understand that reacting from a position of fear limits the scope of our reaction to within the general area which the terrorists desired when they committed the act. So their act produced a predictable reaction on our part. And is predictability a sound tactic? But what if, instead, we reacted to the situation not from the perspective of fear, but from an objective perspective? What would, then, be the best course of action? We might discover that instead of banning Muslims, it would be better to embrace them. Dividing Christians from Muslims (or any other group) will only breed increasing conflict, but uniting with them may breed greater harmony. In the end, believing that we can control or suppress terrorism may be folly, but what we can control is our reaction to it. The Syrian Refugee Crisis and the Islamic State. Syria is in the midst of a bloody, four year old, civil war and their population is fleeing in a mass exodus. Four million people have fled the country since the war started, with a further 7.6 million displaced from their homes within Syria. Since the spring of 2011, more than 250,000 Syrians have died. To put that number into perspective, that would be approximately 150 dead each and every day, compared to the 130 killed in the Paris terrorist attacks last week. 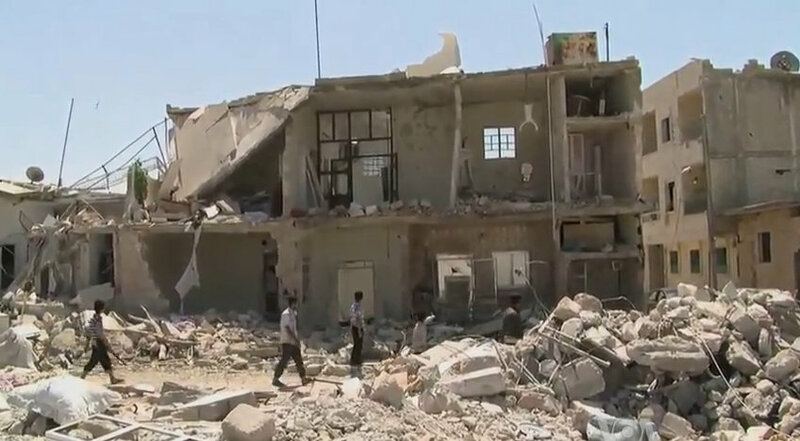 After aerial bombardment by the Syrian government of rebel-held areas of Azaz in Aleppo governorate. So, the reasons why Syrians are fleeing Syria seems fairly obvious, but their large numbers are beginning to strain the resources of nearby countries (Turkey, Lebanon, Jordan, Iraq and Egypt) which have, until recently, taken in the bulk of these refugees. But, this summer, the Syrians began to travel the long, overland, route through the Balkans to the European Union, and the Europeans have not responded well to the influx. Germany, France, Italy, Sweden and the Netherlands, again, have taken the lion's share of the refugees, while at least 12 EU countries have taken virtually none. And then, in October, Hungary completed the construction of a 109 mile fence along its border with Serbia and Croatia, at a cost of $106 million. Until this week, the world seemed prepared to try and deal with the problem, with Germany, France and the US preparing to do their parts. Then, on the evening of Friday, November 13, Isis terrorists attacked Paris with coordinated bombings and shootings which killed 130 people. Now, in response to these attacks, the doors of many countries around the world are slamming shut in fear that terrorists may be slipping across borders, posing as refugees. So, this is where the world currently stands: a huge number of refugees of an ongoing civil war are in desperate need of humanitarian aid and the world seems willing, in the face of admittedly warranted fear of terrorist violence, to abandon them. A situation sadly reminiscent of the refusal to accept Jewish refugees during the second world war. This leads to the question of what is the right course of action. The options, at the moment, seem fairly polarized between the desire to do the moral thing (accepting refugees into our countries, in spite of the risks) and doing the safe thing (turning them away, due to the risks). Are these options as clear cut as they seem? The moral option seems cut and dry: hundreds of thousands of human beings need our help or they may die. The second option, however, is more complicated. First, there is no concrete proof, as of yet, that any terrorists have entered other countries in the guise of refugees. And, even if some did, would they be any greater in number, compared to other, arguably, easier methods of inserting terrorists. In fact, it could be argued that the most probable reason for the terrorists to pose as refugees is to instill exactly the type of fear we are witnessing in western hearts. Secondly, would closing our borders actually make us safer? To answer that question we need to understand why the Islamic State has ramped up attacks on international targets recently (the Russian airliner bombing over the Sanai last month, the double suicide bombing in Lebanon last Thursday, and the attacks in Paris last Friday), considering that conventional wisdom, at that point, was leaning towards the belief that Isis was more of a regional threat, with limited global intentions or capabilities; certainly posing less of a threat than Al-Queda. The Islamic State, Isis, Daesh is an extremist military group who seized large tracts of territory in Syria and Iraq in 2014. In June, the group declared the establishment of a Caliphate, a form of Islamic government led by a Caliph. The Caliphate claims authority over Muslims worldwide and administers Sharia law; although much of the Muslim world see it as illegitimate. By creating a caliphate, the islamic State creates a situation where, in theory, all Muslims are obliged to immigrate to the Caliphate. And, although their ranks have expanded, through the savvy use of social media, from 20-30 thousand fighters in 2014 to 80-100 thousand(est.) currently, they have not seen the mass influx of Muslims to the Caliphate that the likely expected. And, herein lies the problem that weighs on the issue of whether closing our borders to refugees is the safe option that many now believe it to be. To maintain their Caliphate, the Islamic State needs to maintain their physical territory and, if they hope to do so, they need to swell their ranks - a lot. So, if moderate Muslims aren't buying what the Islamic State is selling, what is Isis to do? We could make the argument that one strategy would be for them to attack the West at home (especially those states that are accepting Muslim refugees or already have large Muslim populations, like France) in hopes of turning public opinion against Muslims in general and forcing moderate Muslims into the Caliphate. It is interesting to note that Isis has just (Nov. 19) threatened more attacks on Italy and the United states, two other top tier countries, in terms of refugee acceptance. And, in these early days after the Paris attacks, this appears to be exactly what is happening. At least 26 US governors recently declared that they will refuse to take Syrian refugees; Republican presidential candidates issued statements that only Christian refugees should be accepted or that all Muslims should be registered; French opposition leader, Marine Le Pen, said France should immediately stop taking in refugees - and this type of sentiment, of fear and prejudice, seems to be spreading throughout the world. Do we really want to increase tensions and further divisions between Christians and Muslims? When all we offer another person is hate, why would we be surprised when we receive only hate in return - so closing our borders to refugees may not be the wisest course of action; it may not even be the safest course of action; and it, certainly, will never be the moral course of action. This being the inaugural post for my new blog: The Road Towards Common Ground, let's begin by stating my goals and reasons for its existence. I have been a keen observer of world affairs for years and, of late, I see what is, perhaps, a bias creeping into some mainstream media. In every conflict, there are always multiple points of view from which to observe, but if we stubbornly make a stand upon a single viewpoint, we will get a skewed perspective of the conflict. I hope to assimilate as many opposing viewpoints into my reading, and subsequent analysis, as possible, and to present each of them so as to discover a road to some common ground that these multiple perspectives share. I thereby hope to arrive at an honest assessment of the facts - to call it the truth would be inaccurate, since the truth is a slippery concept and is dependent upon whose viewpoint you share. So, as I said, current events have me concerned enough to create this blog; to such a degree, in fact, that I feared not creating it. A sentiment that keeps repeating itself to me, attributed to Edmond Burke and Thomas Jefferson, in one variation or other, is: "All tyranny needs to gain a foothold is for people of good conscience to remain silent." Thus, I begin this blog with that sentiment in mind. I will welcome comments and discussion from all points of view but, while I realize that people will be passionate about their particular viewpoints, I will not allow such galvanized perspectives to become lightning rods for hate. The purpose of looking at an issue from multiple points of view is to bring us together upon some common ground, not to strand us upon separate ideological islands. All comments and discussion must , therefore, remain civilized, polite and constructive. Please refrain from profanity, yelling, or bullying remarks; such behaviour never contributes to a discussion and always weakens your argument. And they will not be allowed.